I got my first real six string when I was 16. Bought it second hand from a wee guitar shop in Irvine that disappeared the day after I paid my £30 for it. The guy who ran it was never seen again. About 2 days later, indulging in a spot of fat-fingered She Sells Sanctuary riffing, the pick-up gave me an electric shock and a temporary Sid Vicious haircut. That guitar was a right temperamental block of wood, but I loved it. I played it till my fingers bled. To paraphrase even further, it was the Summer of ’89. That’s when I realised I’d never be Johnny Marr. I’ve always loved Johnny Marr. In The Smiths, he wrote an obscene number of brilliant, inventive tunes. Lazy writers would go on about his ‘chiming‘, ‘jangly’ guitar sound, but there was far more to his arsenal than that. There was always, even in the Smiths’ most tender moments a bite to his guitar. He could fingerpick. He could play inventive chord patterns. He could fingerpick and play an inventive chord pattern underneath it at the same time. With 10 fingers sounding like 25. ‘Like Lieber and Stoller piano lines playing alongside the guitar‘, to misquote him from the early days in The Smiths. Then there were the open tunings, the Nashville tunings, the hitting strings with knives to get the desired effect. He reinvented the wheel. Johnny was (and probably still is) my idol. Even though he dyes his hair. And runs over 50 miles for fun each and every week. Slightly on the wrong side of cocky (and so would you be if mercurial quicksilver tunes like those fell off your fingers and onto the fretboard as effortlessly as a bride’s knickers), he’s not much older than me, yet he’s done a ridiculous amount of music. Previous posts on here have gone on at length about all the non-Smiths stuff he’s done. There’s literally hundreds of things he’s been involved in. Not always up there with the vintage riffing of yore, but always fresh-sounding and never anything less than interesting. Clearly, he’s the guitarists’ guitarist, the one they call when they need a bit of magic sprinkled on top. Probably not, is most definitely the answer. One of my favourite non-Smiths Johnny moments is on Electronic‘s Forbidden City, from the patchy Raise The Pressure LP released in (gulp) 1996. It runs the whole gamut of Johnny’s guitar attack. A heady rush of major and minor chords played on an acoustic guitar here and electric guitars there, Johnny picking his trademark arpeggios atop some mid-paced strumming. He plays terrific little 2-string run-downs and fills between the singing that are concise and snappy and perfect. On the chorus he lets the right notes ring out at the right times. In a lesser pair of hands, it all might sound a wee bit lumpen. But Johnny knows just how to make his guitar sparkle and sing. By the middle eight, he’s flung in a backwards bit and dooked the whole lot in a bath of feedback before coming back to the song in a ringing, shimmering blaze of glory. The whole track is, of course, carried along brilliantly by a Bernard vocal that recalls New Order at their uplifting, melancholic best. And I believe that’s Kraftwerk’s Karl Bartos on drums as well. What’s not to like? In a typically Marresque coda to all of this, Johnny’s broken hand was put into a special sling that’ll allow him to perform his day job without compromise. 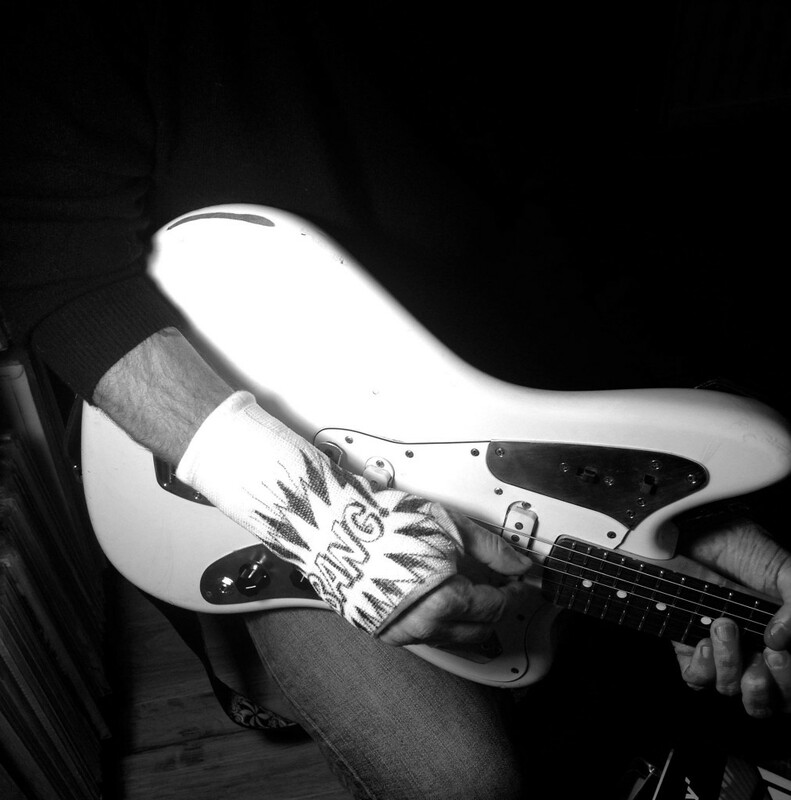 Broken hand or not, no-one plays guitar like Johnny. Love Forbidden City. Electronic should have been able to pull this sort of thing off more often.